Rangers will take a narrow but potentially decisive 1-0 lead to Russia next week following the first leg at Ibrox on Thursday evening, courtesy of a Connor Goldson goal. Steven Gerrard named a starting eleven that showed four changes from Kilmarnock with Allan McGregor, Jon Flanagan, Daniel Candeias and Ryan Jack returning in place of Wes Foderingham, the ineligible Borna Barisic, the injured Jamie Murphy and Andy Halliday. New signing Kyle Lafferty was named as a substitute – and for company on the bench he had former club captain Lee Wallace, returning after an eleven-month injury absence. An electric atmosphere greeted both teams at a sold-out Ibrox – and the Light Blues almost made a dream start inside two minutes when a James Tavernier free-kick from wide on the right was fisted clear by visiting goalkeeper Alexander Belenov, the ball breaking to Candeias on the edge of the area, his volley turned over by the ‘keeper. There was warm applause from the packed stands for Kyle Lafferty when he warmed up along the touchline after ten minutes – and also shortly afterwards for Lee Wallace as he too was amongst the substitutes limbering up. An unorthodox effort from Alfredo Morelos almost produced the opening goal shortly afterwards from a long ball from Connor Goldson, connecting in mid-air he directed the ball towards the net only for Belenov to comfortably hold. The Russians had survived the early pressure – and as the first-half wore on they began to compose themselves and retain possession for lengthy periods without seriously threatening McGregor’ goal. A lenient Polish Referee – one Daniel Stefanski – allowed the visitors to commit a whole series of fouls, seventeen in total throughout the first-half, without once producing a yellow card. 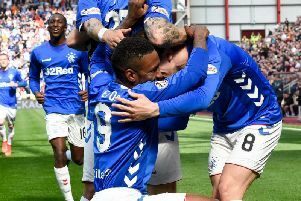 Finally – after 41 minutes - the deadlock was broken when Goldson turned the ball home from close range after a Morelos header from a Ryan Kent corner was parried by Belenov. It’s an old adage that a team is never more vulnerable than after scoring a goal – and that was almost underlined two minutes after Rangers had taken the lead when from a Sylvester Igboun cutback Dmitry Zhivoglyadov’s drive was blocked by McGregor then soon afterwards Jemal Tabidze fired just over. Rangers held their narrow one-goal advantage at the break – and ten minutes after the restart it was Goldson again who almost added a second when he burst through the middle, playing a one-two with Scott Arfield before being crowded out. Finally – to loud acclaim – the referee produced his first yellow card of the evening in the 57th minute for Igboun’s foul on Goldson. Candeias had what appeared to be a sound penalty claim waved away by the referee just before the hour as Rangers continued to apply the bulk of the pressure. Ibrox rose to acclaim the return of Kyle Lafferty when the Ulsterman was introduced on 69 minutes, substituting for Daniel Candeias. The Light Blues stepped up the pace as the minutes ticked away in search of a potentially crucial second goal – although just four minutes after coming on Lafferty was yellow-carded for a foul on Tabidze. Ryan Kent almost secured that second goal in the 72nd minute when he cut in from the left before seeing his 22-yard drive flash just over. Rangers had another – much stronger – penalty claim turned down in the 78th minute when substitute Glenn Middleton was barged off the ball by Ionic Nedelcharu – but once again Daniel Stefanski turned the appeal down. Time eventually ran out on Rangers who will have to be content with a 1-0 lead for the second leg in Russia next week. Best for Rangers were Connor Goldson, Daniel Candeias, Ryan Jack and Ryan Kent.